If you’ve come to find out how to cook beans, then you’re in thr right place. 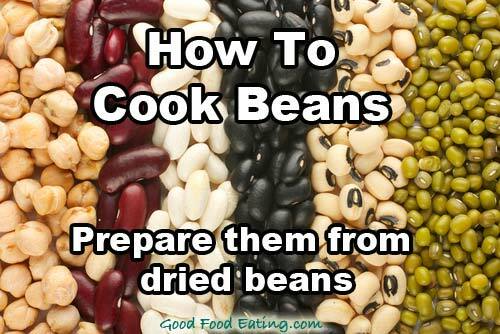 I’ll be sharing how you can easily prepare them and cook them from dried bean varieties. And there are so many varities to choose from adzuki beans, black beans, broad beans, garbanzo beans, kidney beans, lima beans, mung beans, navy beans, black-eyed peas, and chickpeas. Two of my favourites are chickpeas and adzuki beans, and I also like to make sprouts from mung beans. The benefit of cooking them yourself is that you save money, and you get to control the cooking process and additives/preservatives. Your home cooked and prepared beans are going to be much better for you than a tin from the store. Of course we can’t eat dry beans, they have to be cooked to make them edible and help reduce adverse nutritional factors. Heat removes many anti-nutrient factors found in beans including protease inhibitors, hemagglutinins and growth inhibitors. Soaking beans for minimum 16 hours decreases tannin, phenols, trypsin inhibitors and a-amalylase inhibitors. So the best practice for all types of beans and legumes is to soak them overnight, rinse the water, then cook them in a pressure cooker at high heat. This removes trypsin inhibiting activity by 97.8%, and reduces phytic acid by 47.2%. Lectins, another adverse nutritional factor, are also destroyed at high temperatures so well cooked beans and legumes pose less risk in harming your health or disturbing gut health. Soaking and heating beans also increases the protein digestibility of beans. And one trick the Asian culture uses is to soak the beans in water with added apple cider vinegar and then add some seaweed to the pressure cooking process. This aids in further reducing inhibiting factors and aids the digestion processes. Just put a strip of kelp or wakame seaweed into the pressure cooker along with your favourite beans. Cover with water so the water level is about 1-2 inches above the beans. Beans expand while soaking so make sure there is adequate water coverage. TIP: A tip for saving time is to cook more beans than you need. Put the leftovers in a zip lock bag in the freezer and take them out when you need them next.